Stop by the Art Center throughout the festival and take in the art exhibition. Schnitt! 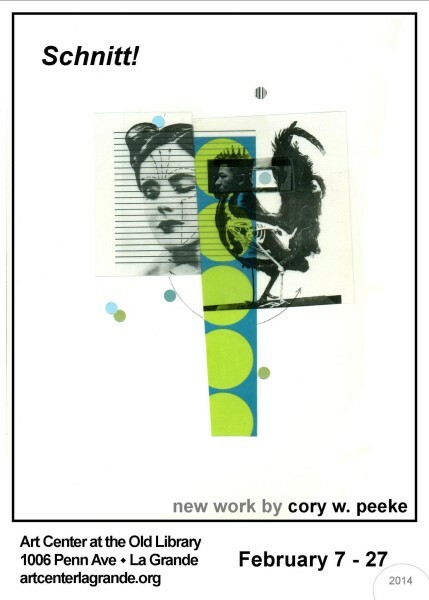 at the Art Center at the Old Library, February 4 – 27, features new work by Cory Peeke, Director of the Nightingale Gallery and Associate Professor of Art & Art History at Eastern Oregon University. Cory’s work combines seemingly inconsequential and diverse bits of ephemera to create collages. The works incorporate this remnant imagery in order to construct images that are at once fresh yet familiar. The new amalgamations explore the transient, disposable nature of our culture as well our need for and connection to the printed image. Art Center, 1006 Penn Avenue in La Grande.